Learn how to clean and polish Patent Leather Shoes using Saphir Vernis Rife Patent Leather Cleaner! Learning how to clean patent leather shoes is easy, but they must be cared for differently than ordinary calfskin shoes. Patent Leather is treated with a polyurethane and acrylic solution to give it its shiny, reflective surface. Most commonly black, patent leather has long been the material of choice for formal dress and dancing shoes. However, one can now also find small leather accessories, such as wallets and purses, made out of patent leather. Patent leather dress shoes are most traditionally oxfords with silk laces (like those pictured left by Edward Green) or, more formally, as an opera pump with grosgrain bows (with my pair of Grenson’s used for the photographs). 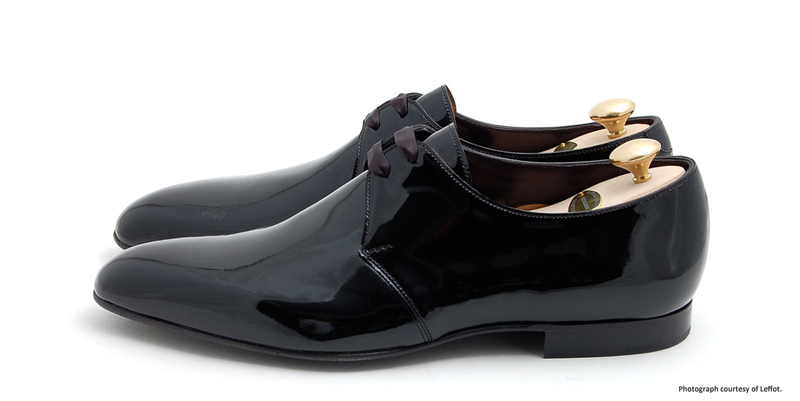 The advantage of patent leather as the material used for dress shoes is that they reflect light as one dances about. And since one is making the effort to wear correct formal footwear, it should also be mentioned that some attention should be paid to one's socks. When wearing patent leather shoes as part of a formal wear outfit, only 100% silk over-the-calf socks in either black or burgundy would be appropriate. 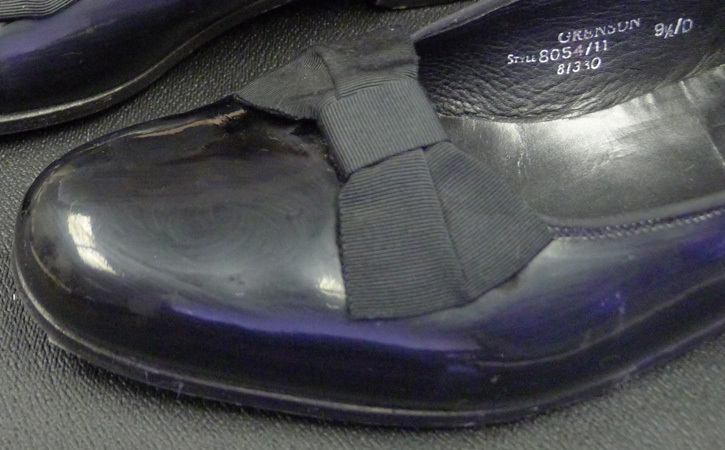 The finish of patent leather shoes is very robust and, generally, does not require much cleaning. However, after time, the gloss of one’s shiny patent leather shoes can begin to fade. A little bit of Saphir’s Vernis Rife and a few minutes can quickly and easily restore the original luster. Saphir’s Vernis Rife is the only specially-formulated patent leather cleaner that I have ever seen. And, speaking personally, finding Vernis Rife has come as a great relief, as my Grenson opera pumps have never been properly cleaned despite years of use! It comes in both neutral and black. The black has a light pigment that can be used to clean small scuff marks. TTo prepare the patent leather shoes to be cleaned with the Saphir Vernis Rife Patent Leather Cleaner, first take a damp (not wet) chamois and wipe away any dust or debris that has accumulated on the shoe. The Saphir Vernis Rife Patent Leather Cleaner is specially formulated for all patent leathers. Use the included chamois, and apply a thick layer to the entire shoe. Once the Vernis Rife Patent Leather Cleaner/Shoe Polish has been allowed to dry, a white film will be visible on the shoe.